The experience acquired with KERS - the electro-mechanical system for the recovery of kinetic energy used for the first time in 2008 in Formula1 and today fitted on racing vehicles -- led to the development of the Magneti Marelli electric engines. This technological revolution benefits greatly from the long-term knowledge gained by Magneti Marelli in the field of electrical machinery combined with the most advanced FEM design, simulation and analysis systems. The optimization achieved in the design phases has made it possible to obtain state-of-the-art results with regards to development and production flexibility, for an optimal match to customer needs. The ability to obtain a product with compact size, designed for the races, makes it possible to manufacture components that can also be installed in the reduced spaces available on vehicles already in production, consequently not conceived for hybrid systems. The consequent weight reduction also proves to be an advantage in terms of the reduction in CO2 emissions. Engines are developed with the goal of maximum performance optimization, also thanks to the joint use of Magneti Marelli control electronics. 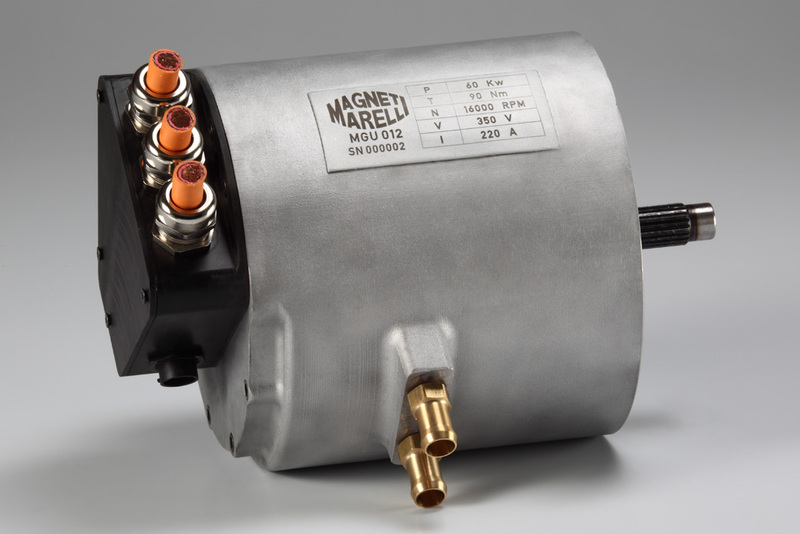 In fact, one of the peculiar features of Magneti Marelli’s hybrid systems is the fact that the development of the mechanical part goes hand in hand with the development of the electronic part by the same work team, which is unique in the market of components for electric engines. High-voltage system: allows the highest performances to be obtained in terms of power and torque, and requires specific devices to ensure adequate safety levels due to the voltage levels involved (up to 500 Volt). asynchronous: where torque is requested but maximum power levels are not necessary. Low voltage system (with electronic components developed with STM): where the non-dangerous voltage levels allows safety devices to be simplified, with a considerable reduction in component complexity and significantly lower costs. This system also features two types of engine, synchronous and asynchronous, with two types of cooling systems currently being developed: water cooling for powers between 12 kw and 45 kw, and air cooling for powers of less than 12 kw.